A few years ago, after several serious injuries, I knew it was time to seek white cane training. The wait for such services in my state can be 2-3 years long. I took to the internet to find alternatives and discovered the Accelerated Orientation and Mobility (AOM) program at Leader Dogs for the Blind. This week-long course was free, including airfare to the training center in Michigan. I knew this was a great opportunity so I applied. It was one of the most important steps I have taken to adjust to my vision loss. I had no idea how much there was to learn about Orientation and Mobility and how much it would change my life for the better. I had a wonderful experience at Leader Dogs and want to share this resource with others who may be considering cane training. Here you will find an interview with Erica Ihrke who works at Leader Dog with the AOM program. Audrey: Tell me a bit about yourself, credentials, and professional experience. Erica: I am a Certified Orientation & Mobility Specialist (COMS) and the Manager of Extended Services at Leader Dogs for the Blind. I’ve been employed at Leader Dog for the past 16 years. I have a Bachelor of Science in Elementary Education from Central Michigan University and Master of Arts in Orientation & Mobility from Western Michigan University. I have been a part of the team to incorporate GPS into the guide dog curriculum here at Leader Dog. Accelerated O&M Training has grown from an average of 26 clients per year to 75 last fiscal year. Summer Experience Camp was developed and O&M Interns are now a part of the Leader Dog culture. I have published two research articles with colleagues about GPS and its benefits for people who are blind or visually impaired. Additionally, I have presented at local, national & international conferences about the Leader Dog model used for O&M instruction and various topics related to accessible GPS. Audrey: What do you find most rewarding about teaching O+M skills to clients? Erica: The thing I love most about teaching O&M is actually teaching. Through the model that we use at Leader Dog we quickly see growth in skills. Clients that arrive on Sunday and depart the following Saturday are noticeably transformed with new skills for daily travel. Audrey: Why are O+M and cane skills important? What do you see as the benefits to clients? Erica: O&M skills are so important because if you know how to get somewhere and can do it safely then opportunities are made available. The benefits are endless… socialization, work, fitness and health, etc. Audrey: Can you give a brief explanation of the training and highlight the skills needed to be a safe and independent traveler? Erica: O&M training that occurs through Accelerated O&M at Leader Dog starts with arrivals on Sunday and departures on Saturday. One -on-one instruction with a COMS occurs Monday through Friday. On each day two to three lessons are completed in morning and afternoon sessions with short breaks in between each lesson to digest information. Generally one night travel lesson is accomplished after dark one evening. The skills taught to be a safe and independent traveler include using a white cane, utilizing a human guide,orientation skills and cardinal directions (i.e., north, south, east, west) to know where you are, where you want to go and how to get there, solving problems such as barriers, crowds, etc., crossing streets safely, re-orientating, shopping, soliciting assistance when needed, and more. Training takes place in a wide variety of environments, such as residential, semi-business, business, city and country settings. Audrey: In your professional opinion, when is it time for O+M training? How do you know when you are ready for this as a visually impaired person? Erica: It’s time for O&M training when you find yourself looking down to travel rather than keeping your head up, when you find that you are bumping into things that you didn’t see, or when you find you are limiting the places to which you go. O&M training is not a one-time instruction and then you are done. If you have had O&M training previously you should consider retraining if you are experiencing changes in your environment (a move or new traffic controls are put into place) or changes in your confidence or skill level. Audrey: What do you see as the barriers and resistance clients have to O+M training? Erica: One barrier to O&M training may be that the individual is waiting for services in his/her home area and that service is not provided in a frequent and on-going manner. 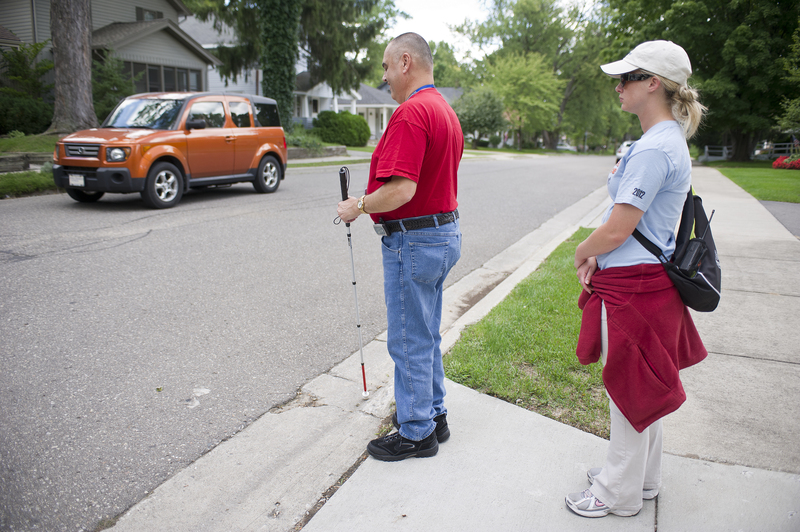 A resistance to O&M training may be that someone does not want to carry a white cane. In this instance it is best that the individual is accepting of needing some assistance. 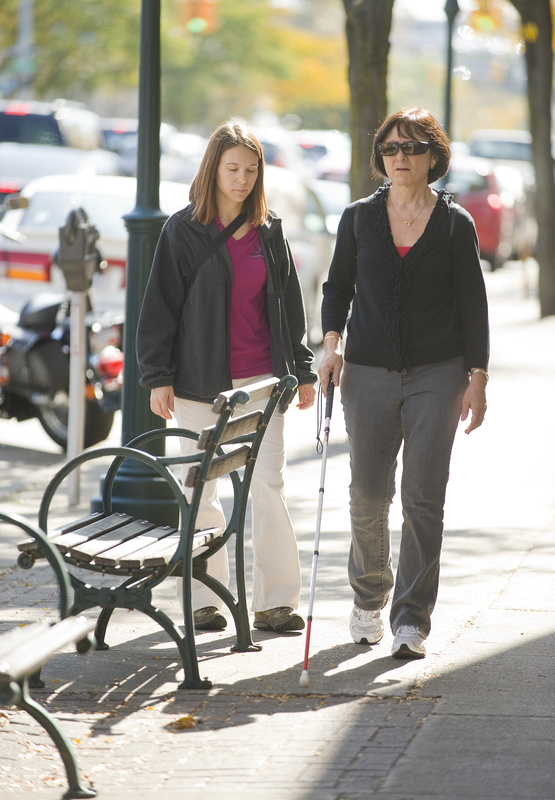 A cane is an identifier and does create more awareness of a person’s visual impairment. Additionally it is a tool that can help identify obstacles and locate landmarks. But there is more to O&M than utilizing a white cane. More importantly it is knowing where you are, being able to plan where you want to go & knowing how to get there safely. Audrey: What do clients say once they have experienced the skills to travel with a cane? Erica: I’ve had several clients tell me that they didn’t think they needed more O&M training and they just came because we required it for them to go on to guide dog training with a Leader Dog. They have ALL also told me that they were extremely glad they came for training because they learned so much and now felt more comfortable with their travel abilities. “[Because my O&M instructor is keeping me safe during training] I know that I am going to be able to make mistakes, it’s going to be OK, and I’m also going to be able to succeed and feel good about it,” said client Sheila Roussey. “I just wanted to get more proficient to use the cane so that I could get around a lot better and not have to depend on people,” said client Susan Miller. Thank you Erica for sharing this information. 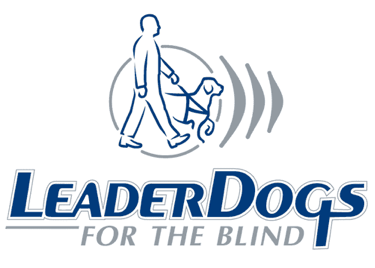 And thank you Leader Dogs for the Blind for your commitment and dedication to the mission of empowering people who are blind, visually impaired and deaf-blind with lifelong skills of independent and safe travel. To learn more and apply to the AOM program visit: http://www.leaderdog.org/clients/programs/accelerated-o-m-program Happy Trails! !